The High Scores are playing JACKPOT again! This is a fun monthly event hosted by Black Apple International. 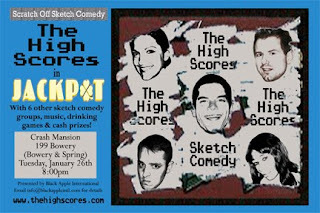 See us perform with 6 other sketch groups, plus groove to a live band, play some drinking games, and win some cash prizes. And tickets are only $10. Cheaper than seeing Avatar again!